This entry was posted on Monday, September 29th, 2014 by Frances Ryan. I wasn’t excited about the race when I woke up in the morning. In fact, I told myself I was done with marathons; I just didn’t enjoy the early starts. Within minutes, however, I’d convinced myself that maybe I’d just do the Edinburgh Marathon instead. After all, its closeness to my home means that I don’t have to worry about the logistics of getting to the start line—and it’s a flat course compared to the hilliness of Loch Ness. So, that was my mind made up. Then I got to the Loch Ness start line and I began to feel energised by the crowds of runners and by the spectacular scenery. So I told myself that if I finished under 5:30, I’d register for next year’s race. But by the time I hit the half-way mark, my feet began to ache terribly and my muscles suffered because of it. And so I told myself I was done with marathons once again. My body wasn’t made for them and I enjoyed the half marathon distance so much more. Don’t get me wrong, I was enjoying the run (despite the pain) I just wasn’t feeling it in my heart and soul the way I had before. And by the time I got to mile 17 I started to realise I might not make it under goal—though I knew I would make it. Oddly, I was OK with that. I was OK with the idea that I’d be slower than desired. I think it helped that as I made my way around the course, I was excited by the energy surrounding me. And then, by mile 20 I was really, really feeling the energy again. My feet and legs were still sore but I was managing to run more than walk and I was enjoying the experience. 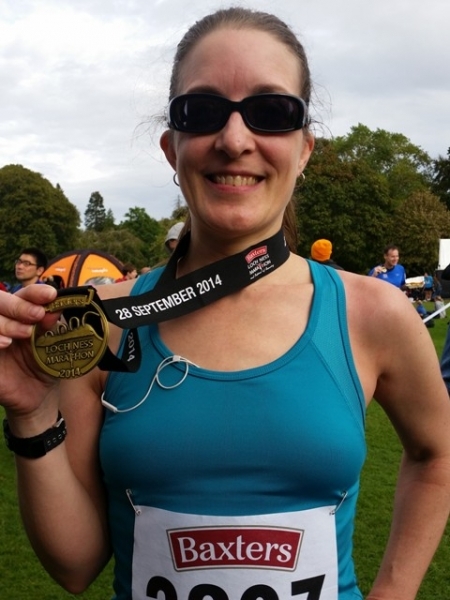 So by mile 22 I knew without a doubt: I would run the Loch Ness Marathon again in 2015. With that decision fully embraced, I found the excited energy I needed to run even more! And all of the sudden, I could see my goal in view again. More running means faster miles, and faster miles means I’d be able to make it in under 5:30. And I did! I crossed the finish line in 5:24.21. Yes, it was slower than my last time, but it was also faster than my first. Importantly, of course, it was a finishing time. I finished, and that’s an accomplishment on its own. To see more photos from this or other races I’ve done, check out my running gallery here. You are really an amazing woman! I am always inspired by how you challenge yourself then meet or exceed the challenge. Go you!